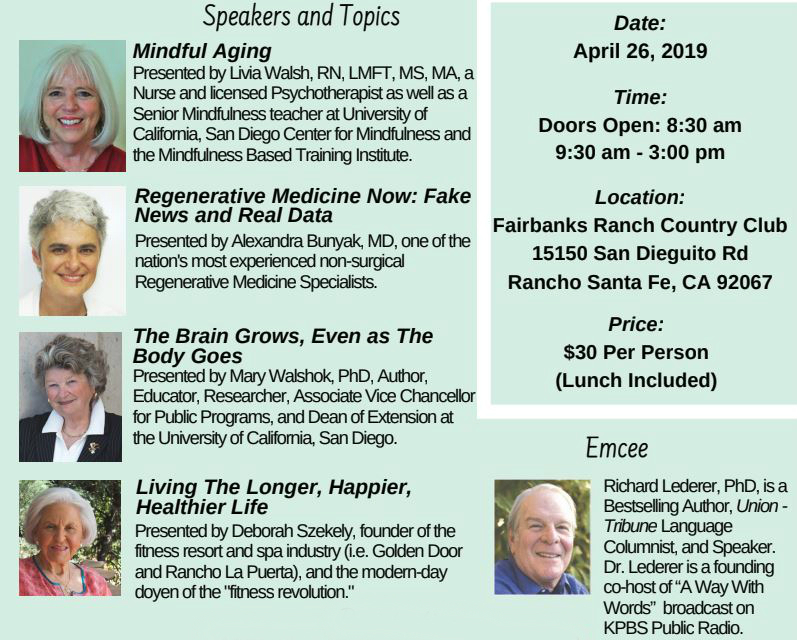 The Rancho Santa Fe Senior Center is proud to present the 5th annual Healthy Aging Conference at Fairbanks Ranch Country Club, in Rancho Santa Fe, CA, on Friday, April 26, 2019. The conference features dynamic speakers, a delicious lunch, the opportunity to explore senior resources, and prize drawings. Master of Ceremonies for the day is Richard Lederer, PhD, renowned author, speaker, and columnist. Conference speakers include Deborah Szekely, founder of fitness resort and spa industry (Golden Door and Rancho La Puerta), Mary Walshok, PhD, Author, Educator, Researcher, Associate Vice Chancellor for Public Programs, and Dean of Extension at UCSD, Alexandra Bunyak, MD, specialist in non-surgical Regenerative Medicine, Livia Walsh, RN, LMFT, MS, MA, Nurse and licensed Psychotherapist and Senior Mindfulness teacher at UCSD’s Center for Mindfulness. The cost of registration is $30 and includes lunch. The deadline for registration is Wednesday, April 19. You can register for the conference by calling the Rancho Santa Fe Senior Center at (858) 756-3041. 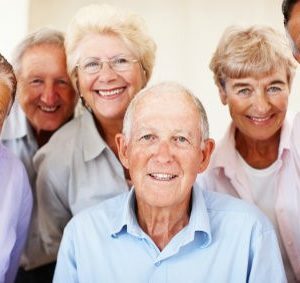 The Rancho Santa Fe Senior Center is a 501(c)(3) non-profit senior service organization providing resource information, informational programs, enrichment classes, and social activities for seniors and their families.